Do Ozone Generators Kill Mold And How Do I Use It Properly? When your home has been damaged by water, you may find the unpleasantness of mold. There are a few different ways to get rid of it, but does an ozone generator kill mold? While ozone generators may be an air purifier, ozone generators can kill mold spores. Even professionals use ozone generators to kill mold. Some people might tell you the dangers of using an ozone generator, but if you use it safely, they are one of the most effective air purifiers. However, you should know how long to run an ozone generator as well. The dangers of using an ozone generator come from the ozone itself. Ozone is composed of oxygen molecules that have three oxygen atoms in them. This is more than the normal oxygen molecule, which has two. Because ozone gas is composed of these three-atom oxygen molecules, it is very reactive to organic things. “Organic” is just another way of saying “living”. This means that it can negatively affect humans, pets, and plants. However, this also means that things like mold, bacteria, and viruses are affected too. There are many dangers of using ozone, but there are ways to use it safely. Because ozone is so reactive to organic things, it can cause damage to their respiratory system, make their cells act differently, and more. It’s not safe to breathe in, but ozone generators are one of the best things to kill living mold spores. Note: Ozone generators can kill mold spores, but it will not remove the dead mold. It also does not correct the conditions that allowed the mold to grow in the first place. Mold is a fungus. You might know a fungus as mushrooms or some other type of toadstool, but there are thousands of different types of fungus. Mushrooms are certainly a type, but those are just a few. Mold is a multicellular organism that grows in warm, damp areas. The type that grows in your house can be toxic to you and others around you, so it should be removed. House molds can also weaken the foundation of the home, allowing things like rot and insects to come in and cause pricey repairs. However, it can also cause a lot of problems for people. It can leave you with discomfort in your chest and head, make it difficult to breathe, and even cause fatigue. People who are sensitive to mold can end up with sickness or worse. It’s extremely difficult to get rid of, so a professional may need to be contacted first. How do Ozone Generators Kill Mold? As stated above, ozone generators produce ozone and ozone affects organic things. Mold is organic, considering it is a fungus. While ozone won’t completely kill all the mold in your home, it will do well to get all the spores and keep it from spreading. If you’re not sure how to remove mold completely, you should start on finding where the water is coming from. This can range from a leaky pipe to humidity, so learn how to repair water damage first. Since ozone is composed of three oxygen molecules, it can combine itself with things like mold and mold spores. It will change them in such ways that it kills the spores and cells that compose the mold. This is the same way it removes odors and other things: killing the bacteria that causes it. Because of its highly-reactive state, the mold and mold spores will die from the gas messing with its chemical makeup. Keep in mind that ozone generators do not kill mold completely by themselves. They must be used in conjunction with other mold remedial processes like replacing surfaces, antimicrobial substances, and water damage restoration. It will certainly help the mold and mildew smell that will come with it and stop the spreading of the mold, though. If you’ve replaced the surfaces and treated the mold areas with antimicrobial liquids or cleaners, the smell will still remain. 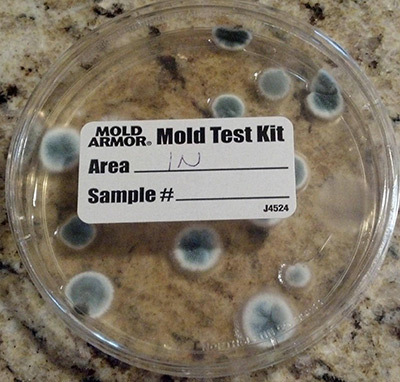 It is also possible that the mold can come back if you don’t get rid of all the spores in the area. With the surface gone or treated, all you have to do is run the ozone generator as you would in a normal situation. The ozone must get to the affected area to be effective, of course. To fully treat a room with an ozone generator, you must set it up in the center of the room or near the affected area. Letting it run for 3 to 6 hours is the optimal timing to let the ozone get through the room and into the cracks and crevices that any lingering mold may hide. The mold spores in the air will be killed by the gas and the surfaces that the mold is on will be sanitized. After the 3-6 hours of the ozone generator running, you have to wait another 1-2 hours for the ozone to settle in the room or building. Ozone will break down and return back to regular oxygen in this amount of time, making it breathable again. It will still smell somewhat like a thunderstorm just happened, but that will be gone over time as well. While ozone can be dangerous to humans and other living things, it will also kill mold and bacteria. With the mold spores killed from the air, it will eliminate the moldy smell that comes with it. Ozone generators are not a magical box that will make all your problems go away, though. There are many applications for ozone and it can be a great tool if used properly and safely. If you think you may choose going the ozone route, take a look at our ozone generator buyers guide. We understand how they work, why they work, how to use them and a strong understanding of output and quality from real world experience in the field. Many use an ozone generator in conjunction with your local emergency restoration services, such as water damage and mold remediation like our company provides to make sure mold never comes back or starts after having water damage in the home. If you’re ever unsure and don’t want to risk anything, there are many professionals out there. They can help you with your mold problem. Ozone is dangerous, that much can be said. However, it is one of the best air purifiers out there, considering it kills the mold spores and bacteria that will cause odors. These are not pleasant smells, so consider using an ozone generator to get rid of them. Do Ozone Generators Remove Odors? Can I Use an Ozone Generator in a Car Safely? How Do Ozone Generators for Pools Work? Do Ozone Generators Really Work for Hunting and Hunting Clothes?